Utility meets ruggedness. The all-electric Quattro A4 Mini Quad was designed to get you and all of your stuff there safely and reliably. With front and rear steel tubular luggage racks, full fenders, splash guards and a reinforced heavy-duty bumper, this mini quad is as practical as it is tough. Blaze new trails with the dual front headlights and stop sure-footedly with the front and rear disc brakes. Powered by a 350 Watt brushed motor and all-terrain off-road tires, you will conquer dirt, gravel, grass and pavement all in the same session. Equipped with a full front and rear suspension system and an upright seating position, you can feel confident that you'll get to where you're going in comfort. The entire drivetrain and lead-acid battery is completely sealed. Much safer than Li-Po and Li-Ion batteries, lead-acid batteries (same type in cars) are not susceptible to the risk of fire. 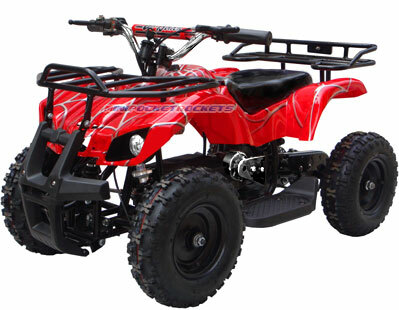 The built-in speed governor allows this Quattro mini quad to be adjusted to any speed and skill level. This electric mini quad includes everything you need to ride right out of the box. Charge it up, attach the handlebars, make a few adjustments with the included tools, strap your gear to the racks and go exploring! Included Free with A4 Mini Quad: Charger, Tools, Tool Case, Keys, Fuses, Starter Stickers, Owner's Manual and our free extended warranty.